August | 2009 | Things I Want but Can't Afford. Things I Want but Can't Afford. House of Holland: Graduate Tights. House of Holland really enjoys color, and I love them for it. I first spotted these while looking for colorful tights for the Fall season on MyTights.com, and then again on real legs a la Susie from Style Bubble. These would be super cute with a shirt or shorts and maybe some combat boots or oxfords. The possibilities and endless, but the price isn’t because their only $14.00. Add to bag ASAP! I am really excited to start my fall shopping. I am pricing motorcycle boots, docs, heels, oxfords, sneakers (given), you name it I’m pricing it. The only issue is, I shouldn’t even be pricing anything. Student loans and living necessities come first. 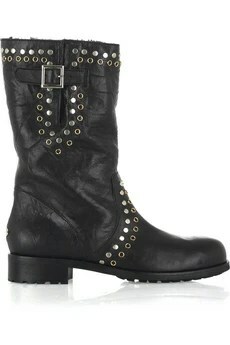 However, if I did have an extra $1,195 to throw around on a pair of shoes, I would buy these Jimmy Choo motorcycle boots. I’ve been into this style of boot for a while now and I suppose now I am just looking for a way cheaper alternative that will satisfy my empty pockets and luxury lusting heart. I love the silver and gold tone studs, adds a little something extra to a silhouette that is so masculine. I really want these. No I need these. Oh Jimmy Choo! Don’t you do this to me! Halo Light – Graffiti Made Easy. I’ve never been a graffiti head like some of my friends or family, I think it’s an under appreciated art form, but that’s where my knowledge and appreciation cuts off. For those street art lovers and graffiti heads out there, French designer Aissa Logerot has created this Halo light for graffiti artists who want to use light and long shutter photography instead of aerosol. The can is shaped just like a can of spray paint but features an LED light where the paint would come out. You can change the color and intensity at the other end, and once it runs out of battery power you can actually shake it up to regain power. I posted this on my other blog, the one where I try really hard to make myself sound a bit cultured, and since this bike isn’t in production and even if it was I probably wouldn’t be able to afford it, it only seemed right for it to be posted here. We Couldn’t Afford it Then.